This past week out team met with the top aquatic plant management firm from across the United States at the SePRO Preferred Applicator Seminar held this year in St. Thomas, VI. SePRO is a life science company that has invested to bring to market a number of the key tools we need to manage invasive aquatic plants and phosphorus pollution. During this meeting, SePRO recognized Dr. Lars Anderson, retired from the USDA ARS Aquatic Plant Management Research Program with a Lifetime Achievement Award. Lars worked on invasive aquatic weed and marine algae issues from his office in Davis California for the past three decades. Bill Cullpepper credited him with the idea to develop immunoassay to rapidly measure herbicide levels in lakes and thereby more accurately dose areas impacted by invasive aquatic weed growth. Aquatechnex biologists Kyle Langan and Adam Kleven were awarded “Seeing is Believing” award for documenting two projects that used new technologies from SePRO to remove phosphorus pollution from our clients lakes limiting eutrophication. The highlight of the evening for us was their selection from over 150 of the top aquatic plant management experts in the United States of Ian Cormican, our Southern California Regional Manager. Ian was presented with the 2012 Applicator of the Year award for leadership in the field of aquatic plant management. Thanks to SePRO and congratulations to Ian for work well done. McDowell Lake is located in the Little Pend Oreille National Wildlife Refuge just east of Coville, Washington. This lake was revered by fly fishers throughout the northwest as one of our premier fishing waters. In the mid 2000’s, the invasive weed Eurasian Milfoil was introduced to the systems. This noxious weed rapidly filled the water column lake wide and choked off access to the fishery. As this pristine water was walk in walk out, fishers with tubes could not move around the lake through the thick growth. The US Fish and Wildlife Service turned to Aquatechnex to help solve this problem. Aquatechnex has a long history of providing programs that can eradicate this invasive species from a water body. We designed and delivered a program that utilized timed treatments of Sonar Aquatic Herbicide in the new Precision Release Pellet technology in 2006. The key to this success is being able to maintain low doses of Sonar in contact with the target vegetation for an extended period of time. The Precision Release Pellet is designed to help accomplish that goal. In the summer of 2007 and 2008, Aquatechnex divers have surveyed the lake and determined that the system remains milfoil free. This lake is added to the list of lake systems we have successfully eradicated Eurasian Milfoil from using our technology. In addition, as is generally the case, native aquatic plants are thriving in the nitch that used to be occupied by the noxious invader. 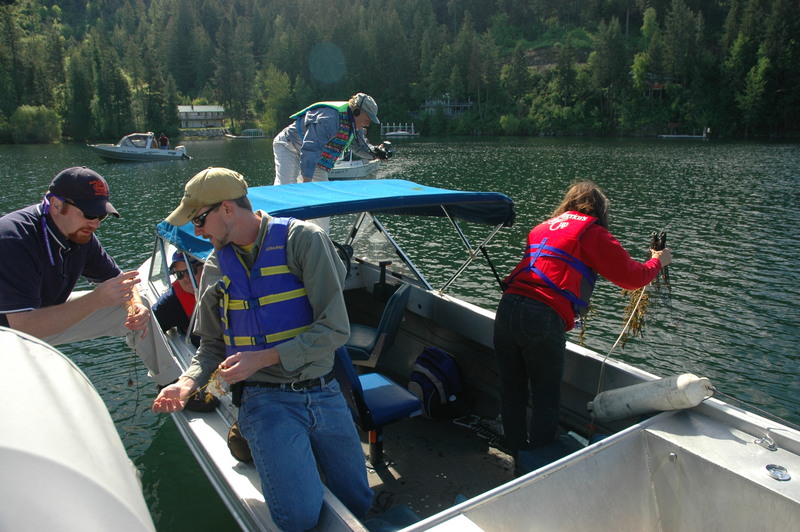 In 2001, the State of Washington came to our company to help solve a Eurasian Milfoil problem in Capitol Lake. This lake is the reflecting basin for the state capitol and is the focal point for the Community. The state maintains park facilities around the lake. Aquatechnex developed an Integrated Aquatic Vegetation Management Plan for the State and implemented it with a successful treatment using Renovate Herbicide in 2004. The lake has been maintained since that time by surveys and diver removal of those plants found. The Invasive Weed Awareness Coalition recently published a fact sheet on this project. You can view it at the link below to see that story. Over the past few years, the Houghton Lake (Michigan) residents have implemented a program to combat an extensive infestation of Eurasian Milfoil. This shallow 20,000 acre lake was completely covered with this invasive aquatic weed in the early 2000’s. Aquatechnex biologists were invited to participate in the Corps of Engineers Program to evaluate and design a solution to this problem. SePRO Corporation took the lead in removing this weed and allowing the native plant communities to recover. During this process, they were able to document the impact of this plant and it’s control on the use of the lake, tourism and property values. This work has been published by SePRO and is available at this link. It is a good read, give it a look. Land and Water Magazine (www.landandwater.com) is the leading resource for water restoration information. The magazine is published six times per year and distributed nationally. In July, Land and Water came to Aquatechnex after learning of our successful Eurasian Milfoil Control Program on Lake Pend Oreille and the Pend Oreille River in North Idaho. During the summer of 2006, our firm was selected to target this infestation with the largest control program ever implemented in the Western United States. The article is available on our web site from the front page along with video footage from local television coverage. To read the article, click here. Eurasian Milfoil infestations in western water bodies continue to claim lives. Early this summer, one of our lakes saw a four year old lost in milfoil at a county beach. While his parents understood he was under, they could not find him in time in the thick milfoil. This past week the milfoil in the Columbia River claims a 22 year old male. Over this past few years, anti herbicide groups have attempted to stop the use of a number of key aquatic herbicides used to combat this weed. While these products are fully cleared by the US EPA to be used in lakes without any harmful results, the claims of these groups do sometimes find an ear. It’s important to note that there are no reports of adverse effects of these products on humans, but the milfoil itself continues to kill where not treated. Last year our company took on the largest aquatic plant management program ever undertaken in the Pacific Northwest when we targeted over 4,000 acres of Eurasian Milfoil on Pend Oreille Lake and River. This program was funded by the Idaho Department of Agriculture. The primary herbicide used was Sonar PR, a controlled release granular formulation. At the end of last summer, the results of this project were not yet clear, Sonar is a very slow acting product. We were however confidant that it would be successful. In June of this year, the state of Idaho contracted with Dr. John Maden of Mississippi State University to study the results and quantify them. His results as reported to the Bonner County Milfoil Task Force were as follows: “the control achieved in all areas is rated from very good to excellent”; and with a rating of 1 for topped out milfoil, 2 for milfoil observed in the water column, 3 for milfoil not visible but collected on a rake sampling system and 4, milfoil not present, Dr. Madsen indicated that of the 1,800 sampling points in last years treatment areas, the average rating was 3.96 on this scale. The Kootenai County Idaho Noxious Weed Department hosted a seminar on Hayden Lake yesterday focused on Eurasian Milfoil Mapping. Tom Woolf from the Idaho Department of Agriculture did an outstanding job of explaining the new mapping protocols that the State wants followed. They want to standardize the reporting of milfoil finds from the many groups that may be doing survey work in the State this coming Season. Idaho has taken a very active stance against this invasive aquatic weed. For the second year their legislature has appropriated about $4 million USD that Counties like Kootenai County can use to combat this weed. Our team spent most of this week over in North Idaho looking at mapping programs. We spend Monday on Lake Pend Oreille with Dr. John Madsen and the Mississippi State team that is evaluating control effort there and helping organize for this year’s treatment. What we saw in a number of our treatment areas from 2006 was very encouraging. Wednesday we joined the group at Hayden Lake and got up to speed on the State’s requirements and efforts. We are looking forward to taking this to the field. We appreciated the invite and thank the County for hosting this event, it was educational and well worth the trip. The Idaho Legislature again appropriated approximately $4 million USD to combat the threat posed by Eurasian Milfoil to the State’s waters. These funds will be provided to a number of local agencies and lake associations to target this invasive aquatic weed. The major focus of control efforts will be in North Idaho where a number of larger lake systems are impacted. Last years efforts in a number of Counties including Bonner and Kootenai had a significant impact on these populations. I just spent an extremely interesting two days at the Lake Tahoe Invasive Species Symposium. This two day event was organized with a couple of different focuses. The first day was organized for technical experts from around the Country and local units of government that are charged with management of this priceless resource. The second day was organized for stakeholders around the lake, those that live on the water or earn their living from the resource.